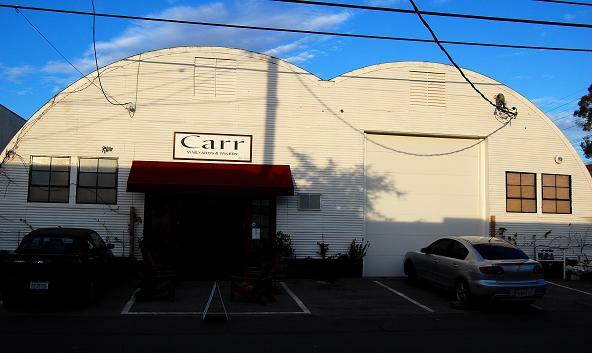 The exterior of Carr Winery is similar to that of its owner’s: surprising. 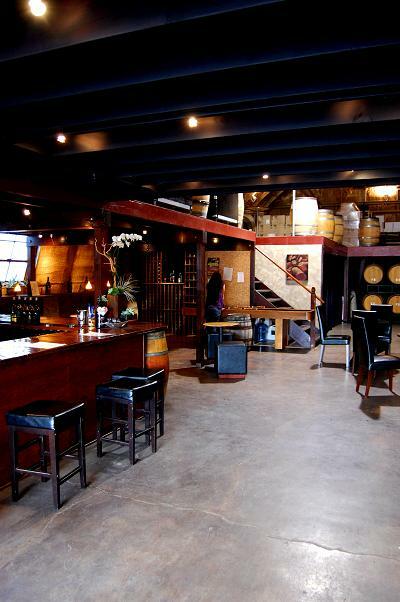 The building has more in common with an old airplane hanger than a winery. Located in an industrial section of downtown Santa Barbara, the white domed building sits amongst auto shops, industrial warehouses, and even a brewery. However, what you find inside is unexpected and beautiful. The dim lighting of the tasting bar provides an atmosphere reminiscent of a neighborhood tavern, and in many ways it is, as it plays host regularly to live bands and parties. 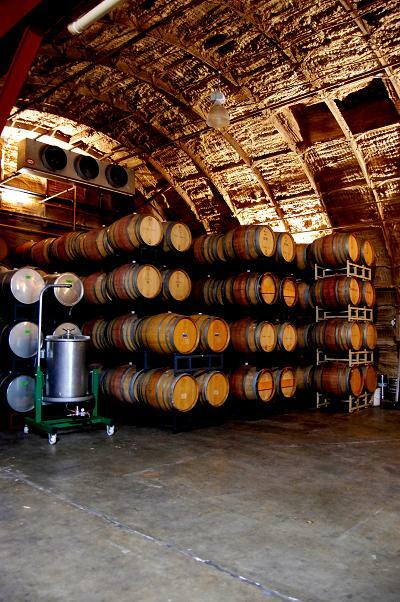 In the back, stacks of barrels rise dramatically towards the high curved ceilings. A large stainless steel winepress sits in the corner. In a similar way, Ryan Carr caught me off-guard. He towered over me (OK, at 5’8″ that’s not that hard to do, but still) as he came out to greet me. But Ryan, the man who owns his own label and manages several vineyards for others is also a young man. Now, while I am not going to say that, Ryan is also unexpected and beautiful; because that just sounds wrong and like I said, he is way bigger than me, I will say his deep knowledge of vineyard management, wine production, and marketing was very impressive. I get this reaction a lot myself, being the gentlemen scholar I am at such a tender age. On a late November evening last year, I sat down with Ryan to discuss his winery and vineyard management company. He had responded quickly to my email request and offered to sit down and speak with me. We made arrangements to meet at his urban wine bunker after I got off work one evening. 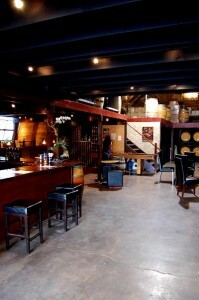 We set-up in his office, a loft area above the wine bar that has been walled off on one side. The bare metal walls give for a rustic unpolished feel, but it is a fitting work space for a man who is “pretty laid back,” to quote him, and preferred a glass (or two) of scotch to my glass of Carr Syrah. Now, there is an important point to be made here, two really. One, you don’t have to always drink wine even if you make it, in-fact sometimes you shouldn’t. For instance, and covering my second point, you should not drink wine, even a glass, if you plan to meet with your new trainer to run stadiums for 45 minuets afterward! I learned a lot about wine that night, in good ways and bad ways! Planting a vineyard as it turns out, was much more expensive than they anticipated. Yet, Ryan didn’t lose interest. After moving to the property and looking after its general care, Ryan had the opportunity to work with a local vineyard manager in the Santa Ynez Valley. It was a chance to learn the ropes of his future trade. “Basically got right in with the crew to start out, was just one of the guys on the pruning crew just to get my feet wet.” After the pruning season, work in the vineyards slowed and Ryan decided to put his college degree in graphic design to work. But, the pursuit was short-lived when Ryan was called back a few months later to be involved on a higher level with the vineyard management team. Over the course of a few years, Ryan had the chance to plant a number of different grapes and vineyards, including planting Royal Oaks Vineyard, now Roblar Winery. Ryan was on his way to becoming a winemaker. “Shortly after I got started…the gentlemen I got into it with decided to focus on one particular ranch which was Royal Oaks…and [he] basically fired myself and my friend Andy. We wanted to continue what we were doing. So, we went around to all of his existing clients and basically said “if you are willing to continue with us, we would like to continue forward”. That was 99/2000, right about that turning point there. So basically we started this farming company together, he, Andy Kahn, was the guy I was working with and he had his own winery, Kahn Winery. He is where I got my start making wine. I made my first vintage in his place.” Ryan was officially in the vineyard management business. A few years later, he purchased Andy’s shares and Carr Vineyards & Winery was born with Ryan operation as sole owner. Ryan currently manages eleven (and growing) vineyards located throughout Santa Barbara County. From Paredon, sitting some 1,100 feet above Montecito and Carpenteria with its coastal views, to Kessler-Haak and Turner vineyards in the famed Santa Rita Hills AVA. From planting to pruning and picking, he manages every aspect of the vineyards care and production. Ryan, is a busy guy. We spoke for an hour and a half in a sweeping conversation covering topics from social networking, to Champagne production, yeast, and his thoughts on wine critics (I am leaving that part out). What unraveled was a very practical yet passionate and fascinating view of an ancient profession. It was the first interview I had done for this project, and will remain one of the most memorable. Of the vineyards you work with do you have a favorite? Or, are they all like children in a way? Is there one aspect of wine making you most enjoy? 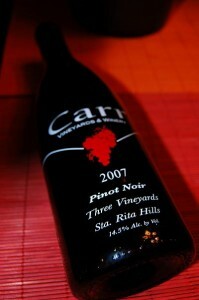 How are you feeling about the 2008 Carr Wines that are to be released later this year? It would be appropriate to note that Carr Winery has been at the front wave of social media, and the pay off-has been big for business. To give an idea of the hub of community activity Carr has become; in part to social networking and many social events at the winery, Carr recently hosted a roast of a popular outgoing city politician. On weekends, Carr really is transformed into a local hangout and music venue. To date, I have yet to see a winery use social media so fluently and I am not the first to have written that about Carr. What role does “social networking” play Carr’s marketing plan? There is much more from that evening I wish I could share, but I can tell you this: Ryan has a bright future. The industry will change, it has too as it always has. And while it is hard to predict what the future holds for California wine, there is no doubt in my mind that Ryan and his team will be right there at the front. 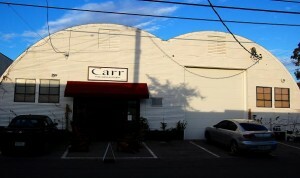 On most weekends you can find live music and other events at Carr. Wines produced Pinot Noir, Pinot Gris, Grenache, Syrah, Cabernet Franc, and one more on the way I have not seen anyone in Santa Barbara doing. Stay tuned.